Lets go on a journey of discovery through the secret rivers in the world’s great cities. Once the rivers ran freely through any industrial city with self-respect, as an integral part of the city’s infrastructure. Houses were built along the banks. The power gave energy to the mills and factories. But as cities grow, the rivers are so polluted that they were deadly disease carriers of everything from plague to cholera. The solution then was to bury rivers in urban areas and merge them with sewer systems – where they have been forgotten, until now. 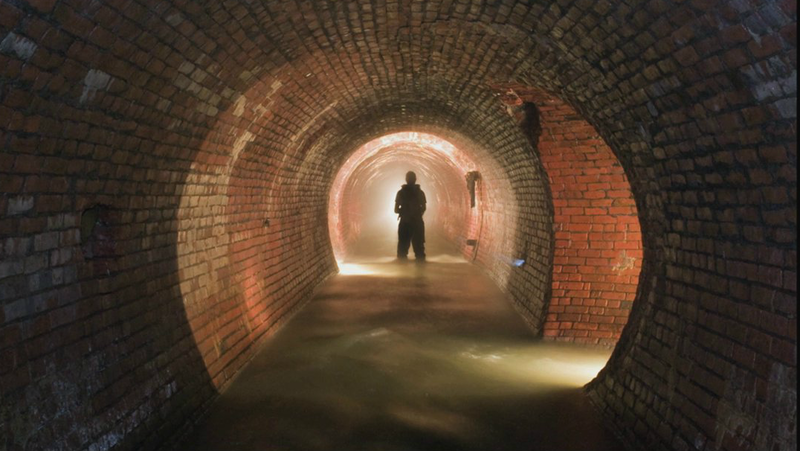 ‘Lost Rivers‘ takes us on an adventure into and through the planet’s interior, and tracks the story of the lost urban rivers by leading us on a journey guided by underground ‘urban explorers‘. We run into the subterranean darkness deep in both Toronto, London and New York, and get an introduction to why so many activists, urban planners and artists are so devoted to reconnecting with the city’s original lifeblood. Further information about the documentary you can find on the website and on the facebook page. Take a trip, follow me, true rivers you will see. Buried deep, in the earth, hiding long, their true berth. Long unseen, forgotten too, yet the pollution rings so true! Where’s the life, where’s the shore, where’s our conscience? Out the door!